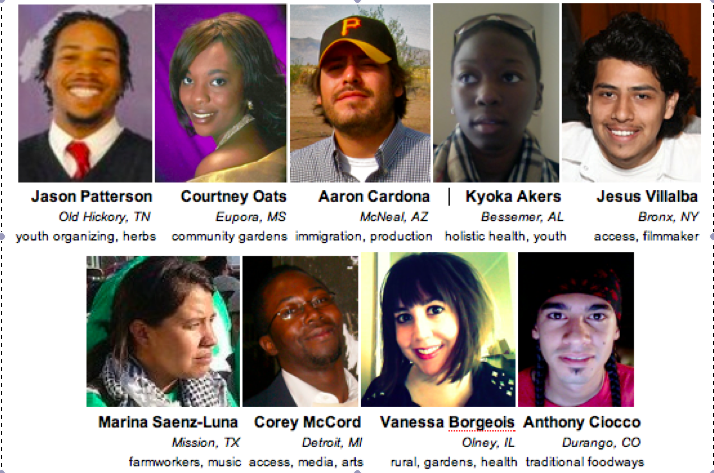 Meet the 2011-2012 Real Food Fellows! Participated in an in-person orientation retreat just outside Boston, MA co-sharing and facilitating discussions and popular education around theories of change, community organizing and building, storytelling for organizing, video production, communications and media, social movement theory. Produced creative multi-media projects related to food. Aaron manages Arevalos Farm, a family business of year-round-grown native and diversified crops in McNeal, Arizona. Vanessa developed community-run gardens in Olney, Illinois. Courtney started a garden at the Fannie Lou Hamer Center for Change as a space for racial healing in Eupora, Mississippi. Participated in a transformative learning journey in summer 2011 called the Food and Freedom Rides - celebration of the civil rights’ movement’s Freedom Rides - by documenting and sharing struggles and solutions in communities most impacted by the industrial food system. Live Real currently seeks funding to train a new class of real food leaders. Please contact us to find out more.